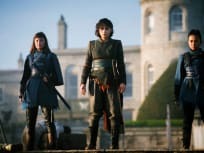 On Into the Badlands Season 3 Episode 13, The Widow, Gaius and Tilda bring an end to the civil war, while Sunny learns who is working with the Black Lotus. 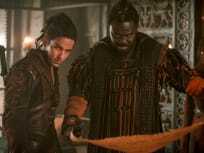 On Into the Badlands Season 3 Episode 12, M.K. and Pilgrim grow their forces, Sunny and Bajie discover a new foe, and the Widow and Baron Chau face off. "The Boar and the Butterfly"
On Into the Badlands Season 3 Episode 11, when the Widow and Bajie team up with the Master. M.K. it leads Pilgrim to a great source of power. On Into the Badlands Season 3 Episode 10, Pilgrim leads the hunt for near-fatally wounded Sunny while The Widow confronts her own inner demons. On Into the Badlands Season 3 Episode 9, Sunny and Bajie end up facing off with Pilgrim while The Widow finds common ground with the Master. 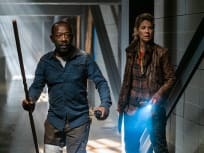 On Into the Badlands Season 3 Episode 8, Moon and Lydia rally the troops, while Sunny and Bajie arrive at Pilgrim's Fortress but face an angry M.K. 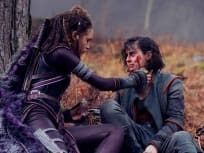 On Into the Badlands Season 3 Episode 7, Morgan attempts to do the right thing, while Madison fights to preserve the life she worked so hard to build. On Into the Badlands Season 3 Episode 6, the Widow interrogates a captive who threatens her tentative peace with Pilgrim, while Sunny and Bajie call in a favor. 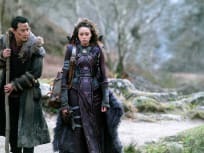 On Into the Badlands Season 3 Episode 5, the Widow must confront a spectre from her past, and Sunny and Bajie look for help from a reclusive former Master. 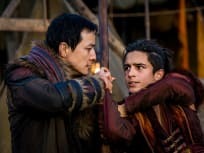 On Into the Badlands Season 3 Episode, Chau enlists her brother in the fight against Pilgrim, while Sunny and Bajie face off with a deadly new foe.